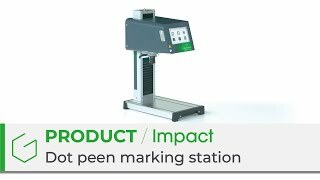 The dot peen marking machines in the IMPACT range are equipped with Touch&Mark technology: they have a touch screen and on-board control software in their marking head. Thanks to their touch screen and the fast and intuitive learning curve offered by its interface, the user can perform marking operations from the moment the machine arrives. The electromagnetic dot peen marking machines with a motorised Z-axis have the I-Sense function. This function detects the surface of the workpiece, automatically adjusts the height of the Z-axis and allows the performance of multi-level marking operations with no intervention on the part of the operator: mark workpieces of complex shape... nothing could be simpler! turbo mode: for even greater speed! The new Dynamic Dot Control enables automatic adjustment of dot density according to the desired size and depth. The markings remain legible and of high quality regardless of the application or character height. The integrated T08 software in the IMPACT marking machines maximises the user experience thanks to its intuitive navigation. The operator can create and edit marking files, store files, merge Excel files, check for duplicates, preview marking jobs and adjust their settings without a computer. Plastics: ABS, PA, PP etc. The marking possibilities offer by IMPACT range from unit parts up to small and medium series runs. Mark parts up to 300mm (12") in height. Accessories available for larger parts. Direct and permanent marking allows the identification of individual parts, whatever your sector of activity.